Stock symbols are shown (bold text) for publicly trading companies. Click on the symbol link for more information. This list is offered as a service to the water-from-air technology field. Companies are added when discovered or told about them. Original equipment manufacturers, distributors, and dealers are represented in the list. Please suggest additions, deletions, and changes (scroll down for easy to use form). Atmoswater Research is not responsible for, and has no control over content of the web sites at these links. Inclusion in this list does not imply endorsement. Disclosure: Atmoswater Research, as an independent contractor, provides or has provided scientific and technical services to some of the companies listed below. Helpful background information for your "due diligence"
Note! Two of the three possible advertising spaces remain available beside the list of suppliers links. Highlight your clean water related products and services on this page, the most popular in the Atmoswater Research website. Visit the Water-from-Air Project Links page to learn about various projects and installations using atmospheric water generators supplied by several companies in this list. Did you see this spot? You are not the only one! You can use this space (Ad-2) to promote your company or organization in the water sector. During 2018, this page had about 512 sessions per month—these are from visitors focused on finding a water-from-air equipment supplier. This advertising space (Ad-2) is available for (USD) $304/month. Please contact Roland Wahlgren. ​Did you see this spot? You are not the only one! You can use this space (Ad-3) to promote your company or organization in the water sector. During 2018, this page had about 512 sessions per month—these are from visitors focused on finding a water-from-air equipment supplier. This advertising space (Ad-3) is available for (USD) $304/month. Please contact Roland Wahlgren. Sources: Public domain information from United States Patent and Trademark Office, company websites, press releases, SEC filings, etc. Air Solar Water & Rain Capture: United States Patent 8,506,675. Air2 Water LLC: United States Patents 5,669,221; 5,845,504; 6,058,718; 6,182,453; 7,089,763; and 7,373,787. Aqua Solutions Corp.: United States Patents 5,106,512; 5,149,446; 5,203,989; and 5,366,705. ​Atmospheric Water Solutions: United States Patents 5,701,749; 6,029,461; 6,289,689; 6,779,358; United States Design Patent D799,255 S.
AtmoWater, Inc.: United States Patents 8,075,652 and 8,398,733. ​DewPoint Systems: United States Patent 7,726,138. Drinkable Air: United States Patent 7,272,947. EcoloBlue, Inc.: United States Patent 7,861,544. Element Four® Technologies Inc.: United States Patent 7,343,754; United States Design Patent D591,411. Eole Water S.A.S. 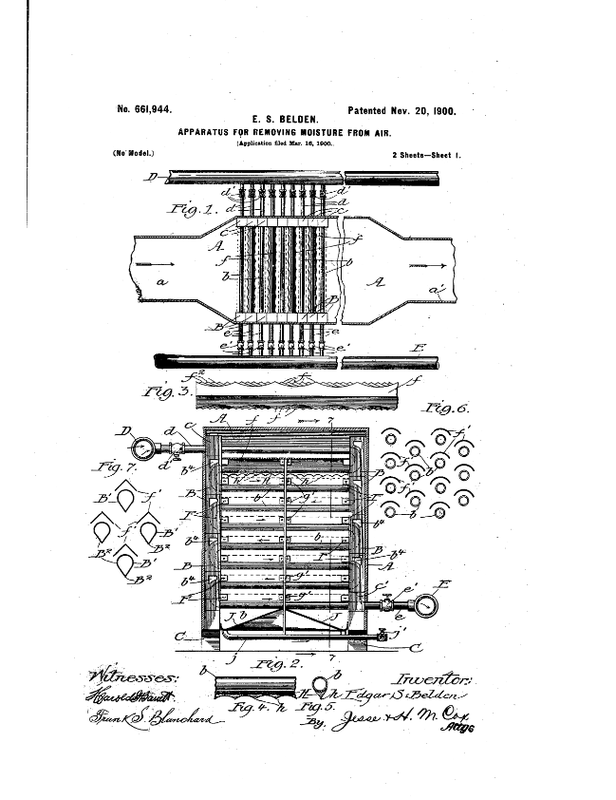 : United States Patent 8,820,107. EuroSport Active World Corp (EAWC) Technologies: United States Patent 6,514,321 B1. Infinite Water, Inc.: United States Patent 9,731,218 B2. Quest Water Solutions Inc.: United States Patent 7,998,255. Stiftung Sanakvo: United States Patent 9,200,434 B2. SuntoWater Technologies LLC: United States Patents 8,834614 B2; 8,845,795 B2; 8,858,684 B2; 8,864,883 B2; 8,876,956 B2; 8,882,888 B2; 8,882,895 B2; 8,920,546 B2; 9,005,349 B2; 9,017,456 B2; 9,039,816 B2; 9,061,239 B2; 9,114,354 B2; and 9,216,142 B2. Vitality Vector, BV: United States Patent 6,336,957 B1. Water-Gen Ltd.: United States Patent 9,140,396 B2. WaterMaker (India) Pvt. 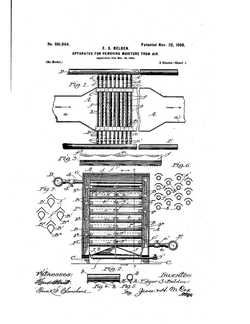 Ltd: United States Patents 5,106,512; 5,149,446; 5,203,989; and 5,366,705. Please let us know about additions, deletions, or changes we should make to this water-from-air equipment supplier list. Thank you!